PDF "Version 3 ColdFire Core User’s Manual" document looks to be corrupted. I can't find anywhere else to report this. There are no Freescale web pages or links for reporting problems like this that I can find. The "Version 3 ColdFire Core User’s Manual" PDF document on Freescale's web site is corrupted. It doesn't display properly in Adobe Acrobat on Windows or t=on the Document Viewer in Ubuntu. Section 4.11 is mangled starting on page 4-25, and has a lot missing. Please advise when a corrected version is available, or if a good version is available from somewhere else. Maybe so, and I guess t looks like it. It has "Freescale" stamped all over it with terrible registration - overlapping existing text in the page headers and footers. The usual Motorola document pages that carry date and version seem to have been removed, so there's no date or version anywhere, except for a red box on page 24 giving a date in 1998 and a version of 0.1. I suspect the original document was OK, but it was broken (PDF corruptions most likely) when stamped with "Freescale". What documents am I meant to read for V3 Coldfire CPUs? Maybe, I don't know... looks like a frame is missing on page 65. BTW, just noticed that there is a note on page 41 (beginning of section 4) saying "Date: 08-21-98 Revision No: 0.1 Pages affecxted: 25, 26 (see change bars)" - however, there are not change bars and not even pages 25 and 26 in this section. I am seeng the same sort of text that appears in Marc VDH's post. I have sent a link to this forum thread to our documentation people to see what the situation is with the file. > I have sent a link to this forum thread to our documentation people to see what the situation is with the file. If someone there could find a copy (from 1998) before "Freescale" was stamped on the PDF then we might have a readable one. Does anyone on this forum have an old Motorola copy (circa 1998) they could email me? > Sorry, the pdf you mentioned is quite old and we do not have a new version of it. By "we" I think they must have meant the people who respond to the Service Requests and not "Freescale as a whole". > The file is fairly old, but we do have the source files for the manual. The "Concrete ColdFire part user manual" doesn't include the instruction list or instruction timing, or any of the information specific to the Version 3 core that isn't detailed anywhere else. You can tell why I gave up on getting anything done via that Service request. I just got a delivery date from our documentation team. be posted by July 17th. The visible faults start on page 4-25. The documentation team is still working on the update forthis document. My apologies for the delay. I just missed the second anniversary of my original report. The manual is still broken. The corrupted "Version 3 Cold Fire Core User Reference Manual" has finally been fixed and I have a copy. In reviewing the document with design, we've actually decided to remove the file from the website. 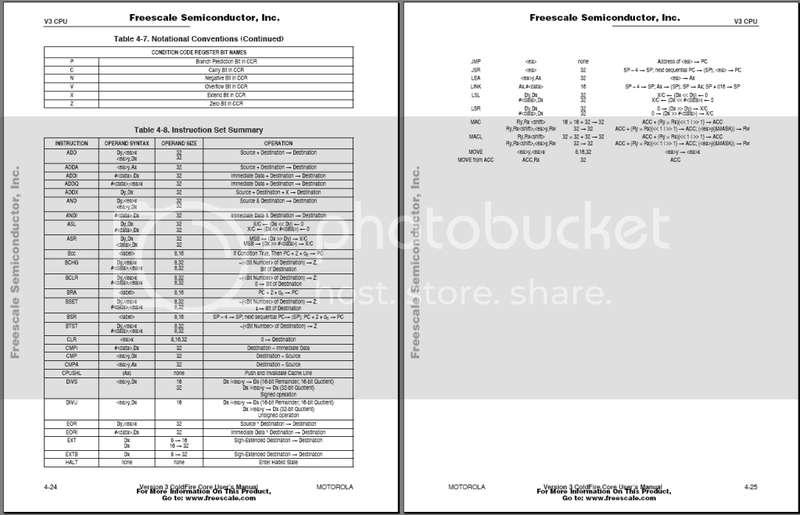 The information in the reference manual for each chip and the programmer's reference manual covers most of the details in this document. I've been sent a copy, but aren't at liberty to share it. I've compared the relevant sections (Core, Cache, Debug, etc) of the MCF5329 manual and this old one. There is a some detail in the old manual that isn't in the newer one, but I don't think it is that relevant to anyone using the chips. It details things like the internal core "pin connections" that we can't get to anyway. So I guess I agree with Freescale's assessment. Re: MCF5xxx Colfire V2 FEC RX Interrupt Stops Firing After "Packet Storm"